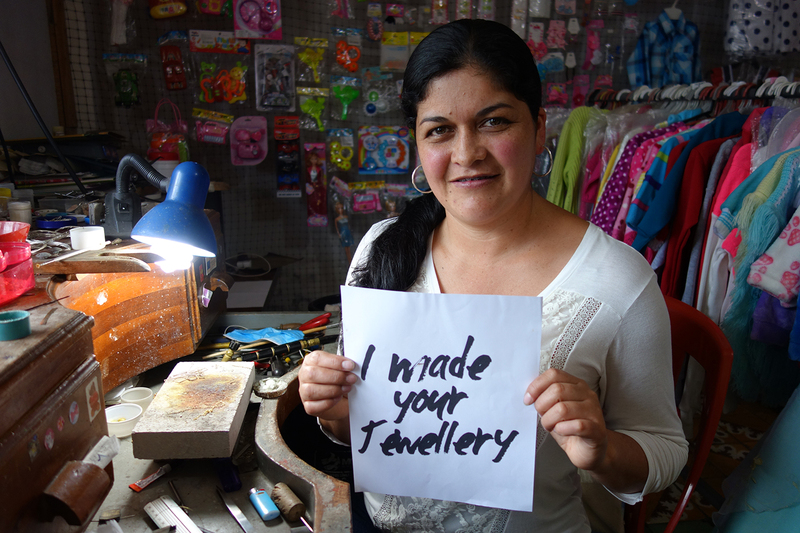 Together, Colombian metal and craftsmanship tell a beautifully sustainable story for Fashion Revolution Week. Award-winning ethical jewellery designer, Arabel Lebrusan, has sourced Fairmined silver from the Iquira Mine in Colombia to create the delicate and feminine new "From Colombia with Love" Collection. The limited edition collection arrives just in time for Fashion Revolution, an initiative that shines a light on innovative emerging designers, established trailblazers and major players, who are finding alternative ways of producing fashion that is mindful of the planet and its resources. 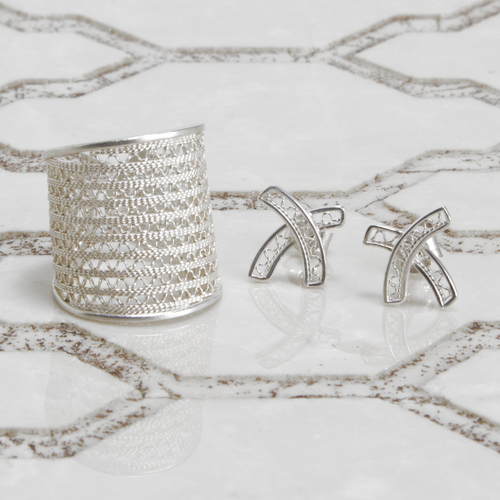 Filigree artisan, Elena, who lives high up in the Colombian mountains, has expertly handcrafted the statement ring and kiss-shaped earrings, designed by Arabel. Arabel visited Elena in La Llanada, Colombia in December 2016, working with her to make the most of her highly skilled techniques. Together, they collaborated with local refiners and Fairmined to bring these exquisite designs to life. One of the most ancient of jewellery-making techniques, filigree is an extraordinary craft, often mistaken for hand engraving. Actually, it is the very opposite. Filigree technique doesn’t involve sculpting or carving; instead it’s the delicate process of weaving together fine, pliable threads of precious metal. The Colombian filigree technique and style is especially distinctive and with only ten copies made of each exquisite Kisses piece, this new addition to the Arabel Lebrusan portfolio is one to treasure. Small-scale mining plays an important role in the local community at Iquira, where the mining cooperative supports more than 200 people through their work. In 2015, the Palme D’Or from the Cannes Film Festivals and the Nobel Peace Prize were fabricated with Fairmined certified gold from Iquira, acknowledging them nationally and internationally as a responsible, ethical cooperative. Arabel Lebrusan took her Masters in Jewellery Design at Central St Martins and went on to become Creative Director at Leblas Jewellery, leaving two years later to create her own brand of unique designs. Arabel commissions only the best craftsman in the UK and her native Spain and insisting on precious metals and gemstones that have been sustainably and ethically sourced. This press release was distributed by ResponseSource Press Release Wire on behalf of Arabel Lebrusan in the following categories: Women's Interest & Beauty, Environment & Nature, Retail & Fashion, for more information visit https://pressreleasewire.responsesource.com/about. Arabel Lebrusan Jewellery, NAJ Designer of the Year 2017. Designer Jewellery brand committed to beautiful design, beautiful craftsmanship & beautiful ethics.